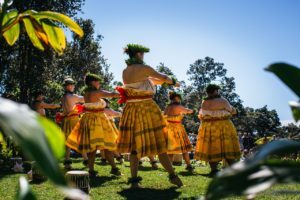 Typically held on the 3rd (or sometimes 2nd) Saturday of each month, hula hālau from across Hawaiʻi have been invited to perform in a one-of-a-kind outdoor setting at the kahua hula (platform) in the Hawai`i Volcanoes National Park. This special site was realized through the vision of (the late) hula master Edith Kanaka`ole, kumu hula of Hālau o Kekuhi. The kahua hula is located just a short walking distance from the Volcano Art Center Gallery in an area known as Ka‘auea. This sacred spot affords the kumu (master) and haumana (student) a pristine view into Halema`uma`u, the home of volcanic deity Pelehonuamea. This schedule is subject to change. Please check with Desiree at (808) 987-7288 or email volcanohula@gmail.com to confirm dates. Held in conjunction with hula kahiko performances, join Kumu hula Moses Kahoʻokele Crabbe with Halauolaokalani, Native Hawaiian cultural specialist Loke Kamanu and her ʻohana, or ‘ukulele player Wes Awana on the lanai of the Volcano Art Gallery as they share with you “Nā Mea Hula” (all things hula). Come and learn a hula, use various hula implements and try your hand at lei making. Experience the different aspects that play an integral role in the life of the hula dancer. These cultural demonstrations are hands-on and family friendly and occur from 11am -1pm on Hula Kahiko performance days. These free events are supported in part by Hawaiʻi Tourism through the Community Enrichment Program. However, National Park fees apply. Anyone who requires an auxiliary aid or service for effective communication or a modification of policies and procedures to participate in this event should contact VAC at (808) 967-8222 or email volcanohula@gmail.com as soon as possible but no later than 14 days before the scheduled event.